See Triangle near center of page marked C. & N.W.R.R. Co. [Chicago and North Western Railroad]; at the lower side of the triangle is the East Rockford Passenger Depot. The street (west-east) above the triangle is Fourth Avenue. The (north-south) street at the left edge of the map is Kishwaukee St.. You can see the Kishwaukee at the lower left corner of the map. A modernized brick building with an office was built on Seventh St. by 1907. *No newspaper records of a fire burning down this station have been found. 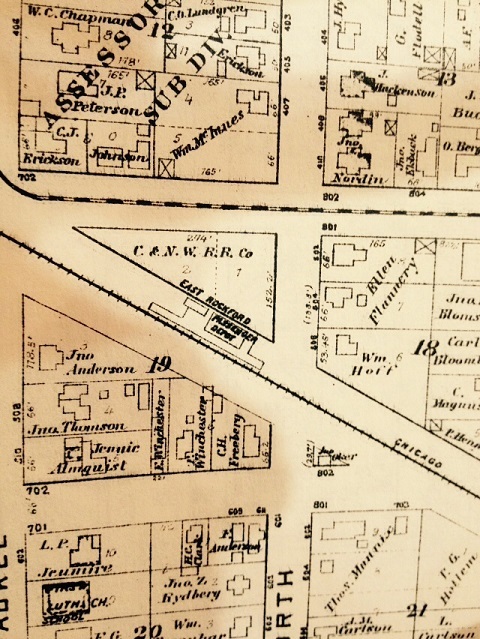 There were 2 North Western depots on the West Side of Rockford and also 2 on the East Side of Rockford. 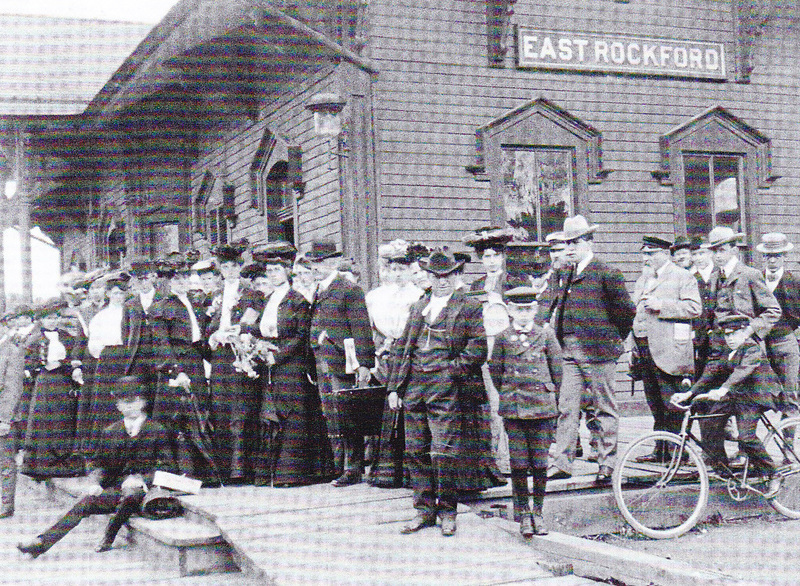 East Rockford Passenger Depot (above) Picture source: “Rockford Through Our Eyes” of “John A. Palm and friends at East Rockford Railway Station, circa 1900.” Courtesy James and John Palm. Presented by The Rockford Register Star, 2010. General, Railway RR, Transportation	1892 Winnebago County Atlas, C. and N.W. RR Passenger Depot, East Rockford Paggenger Depot, Fourth Avenue, Kishwaukee St.
1967: 175 family units were built on the former site of Nocomo Heights off Kishwaukee St. The development was names after Orton Keyes, former executive of Rockford Housing Authority.. Article includes history through 1997. *Nocomo Heights were buildings built for Noncommissioned Officers from Camp Grant and their families.